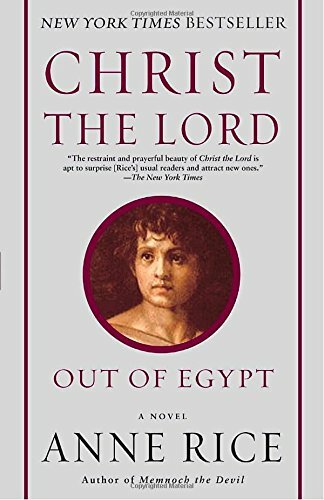 Christ the Lord is written from the perspective of Jesus as a seven-year-old boy as his family leaves Alexandria in Egypt and settles in Nazareth. Rice successfully balances faithfulness to the biblical account, historical evidence, Roman Catholic tradition, and imagination—a very challenging combination for any author. This combination is most successful in her use of setting. Mary's suspicious pregnancy and Herod's brutal attempt to kill the infant rumored to be the Messiah forced Jesus' family to flee to Egypt. Though Jesus is raised in a very traditional and pious Jewish home, his family is known as "the Egyptians" when they return to Nazareth years later. The family's visits to Jerusalem are pivotal in Jesus' growing awareness of his identity and purpose. Ironically, it is in Jerusalem—where he will one day be crucified—that Jesus finally learns about the mysterious events surrounding his birth in Bethlehem. In contrast to the Temple filled with crowds and chaos, another key setting for Jesus' coming of age is the silence and solitude he discovers on the hills just outside the small town of Nazareth. Between the Temple and the hillside, Jesus comes to understand that he will have a unique role in redeeming the brokenness of human culture and of all creation. Rice's portrayal of the women in Jesus' family is also faithful to the Bible, history, and Catholic tradition, however, she imagined them in ways I found both surprising and interesting. Mary's character was the most surprising to me. Rice's portrayal of her gave me new insight into traditions I have not considered very much. For example, most Protestants do not find the Catholic tradition of Mary's perpetual virginity to be very compelling. However, Rice's narrative illustrated how this could be plausible. Mary was recognized as special long before the annunciation. For example, as a young girl, she was consecrated to help embroider the curtain that covers the Holy of Holies in the Temple. While Jesus grows in his understanding of the way the world works, Mary's childlike innocence remains unchanged throughout the novel. At this stage in Jesus' life, Rice portrays his father Joseph as a much fuller character than Mary. I'm interested to see how Mary's character develops further during the course of the Christ the Lord series. Elizabeth, the mother of John the Baptist, is also a very intriguing character. Jesus and his family are stunned by her decision to send John to study with the Essenes. Another strong female character is "Old Sarah." At one point her quick thinking saves Jesus' family from a potentially deadly clash with Roman soldiers. Finally, Jesus' cousin and playmate, Salome, is his constant companion in the beginning of the book. After the family settles down in Nazareth, Jesus notices a change in Salome. She spends more time working with the women and less time playing with the children. She even stops attending classes at the synagogue. She drops out of the narrative until the very end, when she pauses from her busyness and stops to listen to Jesus. When Jesus has an epiphany about his purpose, he shares it with Salome. In a way, Salome's story parallel's the author's experience of knowing Christ as a child, then turning away as an adult, only to return again and know him in a completely new way. Salome's character is not drawn from the Bible, history, or tradition. She is the result of the author's imagination, and her presence provides an opportunity for readers to identify with her and see themselves in the story—to laugh, cry, and journey with Jesus, and, most of all, to come to know him as Lord.